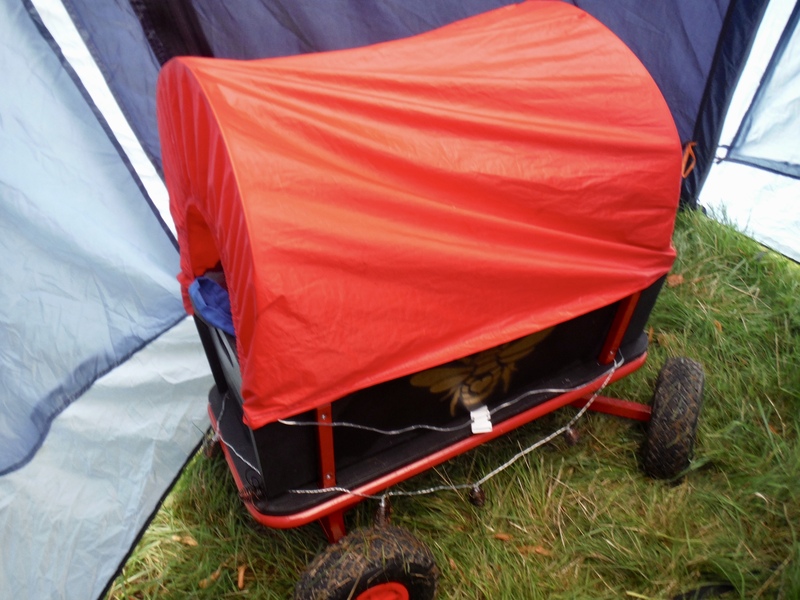 This blog is about our festival wagon that we took to Greenbelt. Quite a few people loved what we did and so I thought I should share it just in case others out there want to do it too. We went for this wagon for two reasons. Firstly it had an inbuilt canopy and secondly it looked sturdy and safe. The wagon was easy to put together and all the sides easily came off to get it in the car. The most obvious was to make this wagon our own was by painting and as the wood needed something to protect and this seemed the easiest way. After much discussion my husband came up with ingenious idea to paint it in chalkboard paint. The chalkboard paint we bought could be used outside so worked to protect the wood and be practical. This was the greatest idea. It gave our daughter hours of fun (more fun than I dreamed it would), which meant we needed less toys and in built distraction! We next put a stencil on the two sides of a bee in gold spray paint. This worked perfectly as I found some outdoor solar powered bee fairy lights to pop on the outside. This just finished it off and gave it a little sparkle. We did buy a cheap pillow and blanket that matched the theme but these weren’t really needed as we didn’t get the opportunity to use it at night otherwise they probably would. Finally we used our Chicco snack pocket chair, strapping it underneath to give our little one somewhere to sit but more importantly to stop her standing as we pulled it along. This also meant that behind her chair would could put some things we needed for the day, so we weren’t carry it all. If you loved this idea let us know and if you want to copy it please credit this post if you share it online. Also if you have any other great ideas write to us in the comments. We love to hear from you.